Looking for advice. I find the Echophon pretty bulky for what it does and have been considering using a Morphagene to replace it. This is largely because I want more flexibility with my system, and it seems like the Morphagene does everything that the Echophon can do plus much more. As always, appreciate the thoughts. Not a bad idea, although the king of delay functionality is probably the Intellijel Rainmaker. It's bigger...but you could conceivably fit it if you yanked the Dual VCA and the Dynamix for starters, replacing them with a Codex u4xVCA (8 hp clone of the Mutable Veils) in the Dynamix's spot. This would also open up 2 hp in the top, which could then allow you to put a Xaoc Zadar in for four EGs in the spot now occupied by the one EG in the Contour. More cost, perhaps, but much more functionality! Thank you for your suggestions, Lugia! I didn't know about Codex Modulex, but they look great and their VCA looks like what I've been looking for. You've suggested before that I didn't need two LPGs with the Optomix and the Dynamix, but I find they function so differently that I couldn't get rid of either one of them. I'll have to try out the Rainmaker before I dive in, though. It's a pricey meat-a-ball, and a big one at that. Well, of those two, only the Optomix is a "true" LPG. 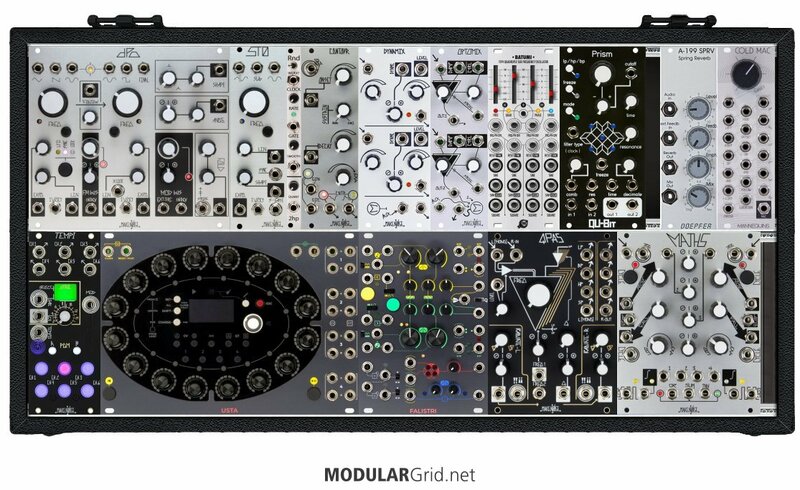 It uses the vactrol design, which puts it into the same operational category as the original Buchla LPGs in that the decay aspects are going to have that "organic" envelope drop-off. Other versions that use a much faster/more responsive VCA+LPF combo (like the Dynamix) aren't going to have the blurring of contour that the vactrol designs tend to possess. So with those, you could easily shift to a VCA that's being fed via a lowpass VCF (or vice versa, if that works) controlled by similar envelopes...but you can't quite do a 1:1 replacement of a vactrol device like a LPG with that combo. Another thing about the Codex Veils clone...you have that sweepable VCA response curve on it, which will offer you more flexibility than simply having either fixed linear or exponential responses. Very useful if you want a VCA to respond more or less aggressively, as the situation might dictate. Plus, if you want to break out VCA 1 on it, you can still mix the outs of VCAs 2-4, etc. Another option for the 4XVCA could be the Doepfer A 135-2 which I find super useful and compact. Also, never used the Zadar, but I'd also consider Pamela's new workout.